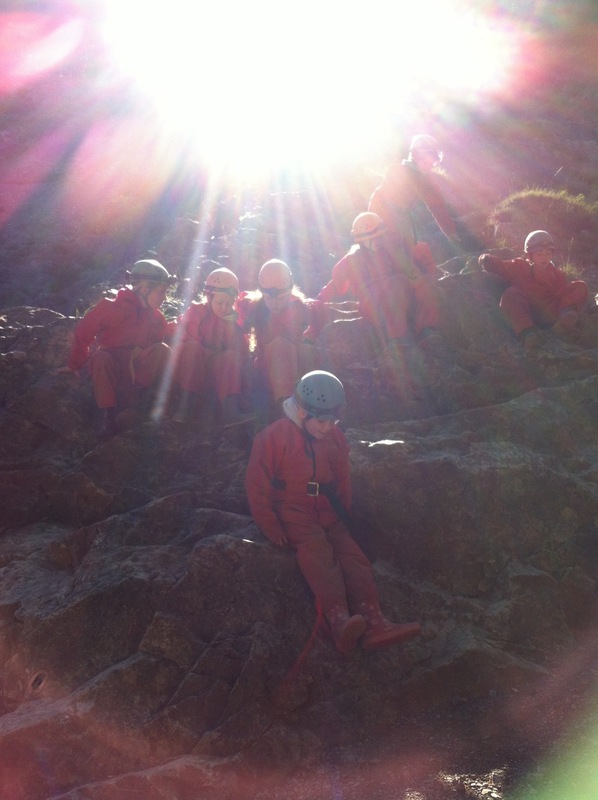 Spring 2015, I got the go-ahead to organise a caving trip for a class of year 5 and 6 children, followed by a day workshop – and this workshop was to be something creative, which the children would benefit from. 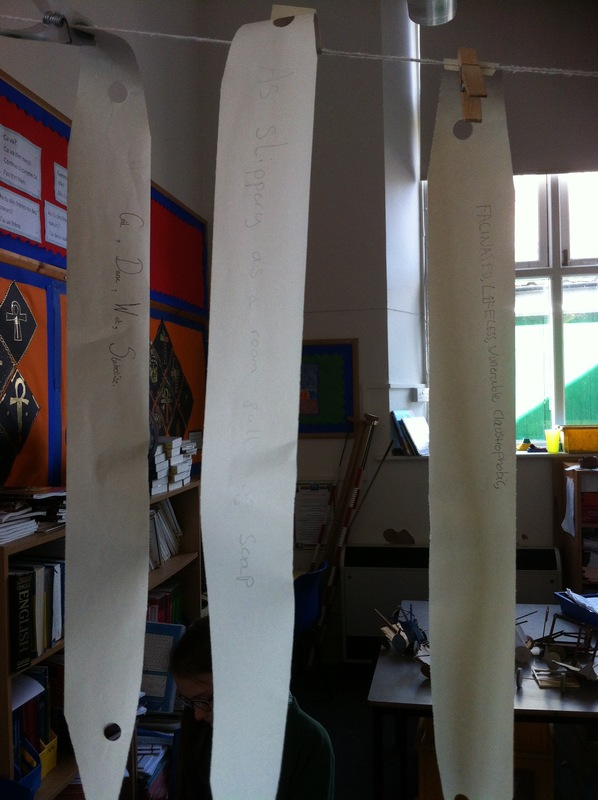 Blagdon school chose to have a day of poetry writing for the class. The trip was set for June 8th. 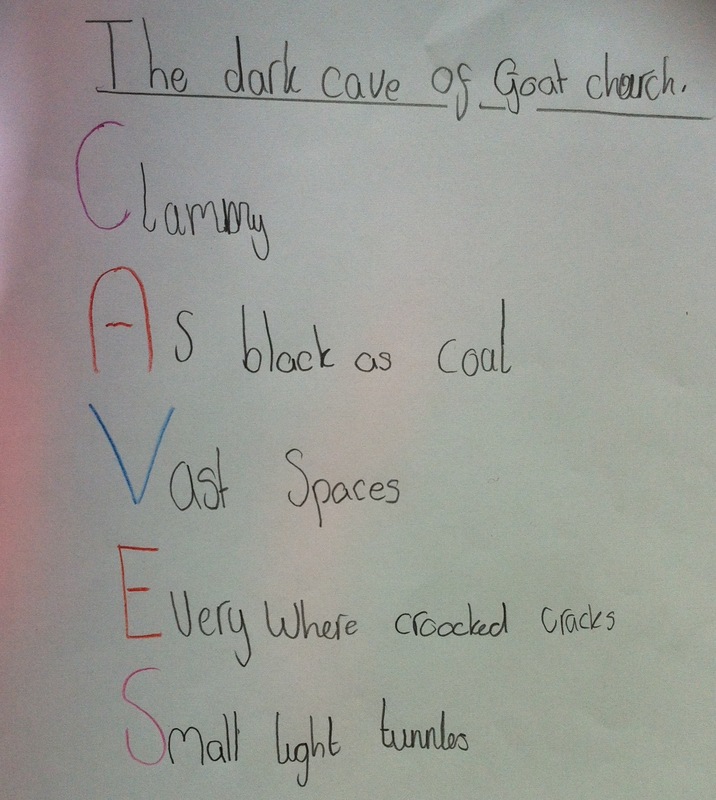 A coach relayed children to the caves: there were four expeditions that day at Burrington Combe. We had to climb into overalls, wear hard hats and belts, and have our safety talk. Walking to Goatchurch Cavern, we heard stories along the way from Rachel and Andy Sparrow and Andy Chamberlain, of skulls found in Aveline’s Hole, geology, geography, pre-history and the Victorian visitors who paid at the entrance and went caving with heavy wet through old hemp rope, in long skirts and cloth caps. A couple of feet at a time, we went down the giant staircase, down keyhole shaped passages and shallow descending sandy slopes, in the ambient temperature which remains the same in summer and winter. We saw cave spiders and lesser horse-shoe bats. 2015 became irrelevant – time was many layered and it was hard to keep sense of minutes going by. Andy Chamberlain cracked jokes all the way around the cave and told us extraordinary geological facts, so nobody thought of even getting scared. Down the badger pit. Bead of calcite. Brightening the cave with all their shininess. Limestone, slightly acidic water. A fractal waterfall. Boney vegetable smell. It smells like the cupboard in my bedroom. Volcanic ash, like peanut butter. The Drunkard’s alley. Scrunched. Fraught. When I got home I put the words down on a giant piece of card. In the workshop we cut up the words, wrote some more and cut those up too. … and played with words, phrases and points of view. 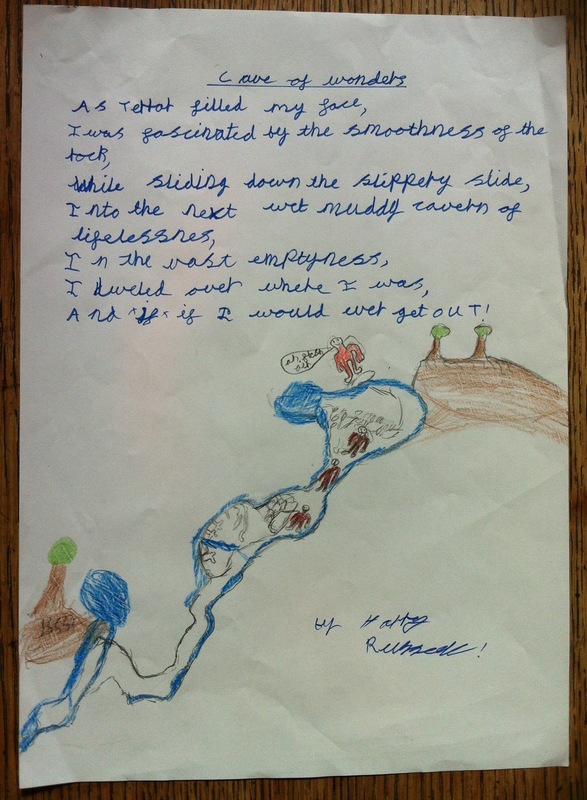 The children wrote over thirty poems, many with illustrations. They worked hard, shared ideas and concentrated. 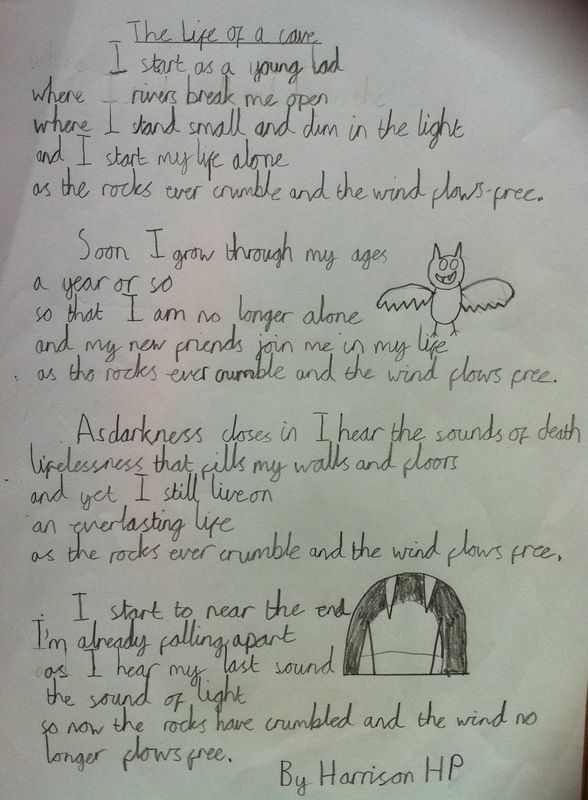 I tried to help each child individually, though could have done with another day, but the children finished off their poems in class over the following week. Some of the children came up to me, all buzzing, in the playground to tell me that they had been working on their poems. The poems will go in the Time Capsule which I’ll be doing next term. The capsule will be filled up with letters and other goodies, ready to be placed in the school attic and to be opened in 25 years time. Thank you to Stuart Bardsley at Discovering Blackdown Project for funding and supporting this project, to the excellent caving instructors and to the teachers and staff at Blagdon who made all this possible. 🙂 “Thanks ever so much for arranging everything for this trip Elspeth. 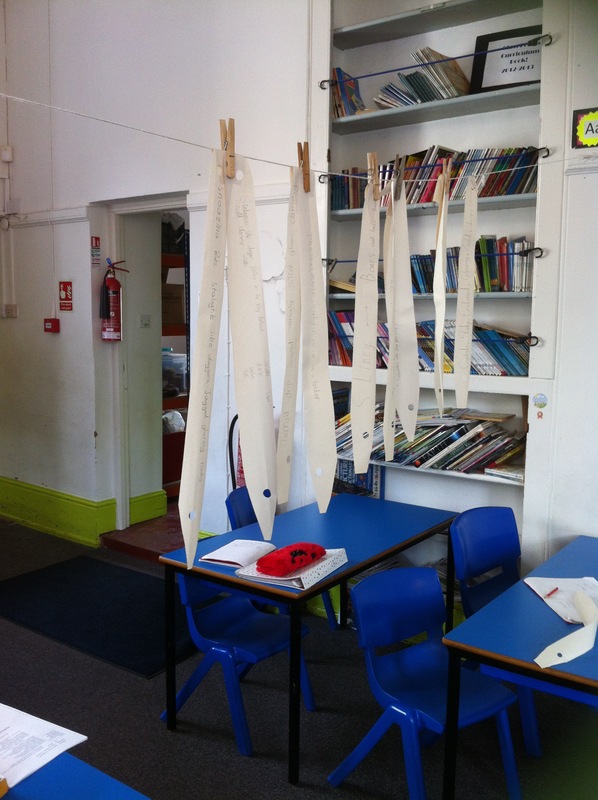 I know the children have had a great time working on this during this term.” Anne Harrison at Blagdon school.